and ten containers of Synergy Clear. and five containers of Synergy Clear. A once a week treatment. Add based on the size of your pool. have tablets in your chemical feeder. treatment. Add at the beginning of your pool season. 1) Add 12.5 lbs. 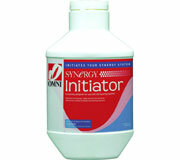 per 10,000 gallons of SYNERGY Initiator into skimmer and let water circulate for 4-8 hours. Do not backwash for 48 hours after this point. 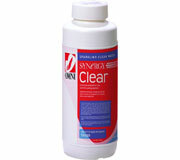 -Chlorine should range between 1.0-1.5ppm. Check chlorine feeder every 3-4 days. 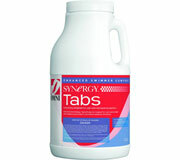 If SYNERGY Tabs are gone or almost gone, add 10-15 more. 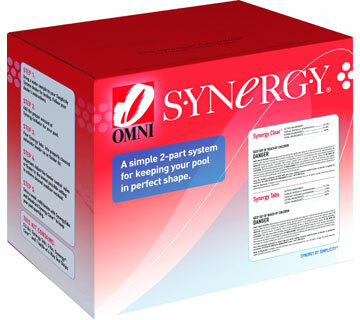 If chlorine level tests too low and needs a quick boost, add an additional dose of SYNERGY Clear that week. If chlorine level is consistently low, open the floating chlorinator more, or cut more holes into non-floating chlorinator. 2) Be sure all levels are correct and water is clear. 3) Add Winter Care Winterizing Kit. (This contains a winter algaecide and winter shock).